How Do You Balance Parenting When You are a Sick Mom? If you are a sick mom who lives with a chronic illness, do you ever wonder how other moms do it all and still smile? WEGO Health asks for their daily writing challenge “I don’t know about this, but I’d like to” I chose to write about parenting when ill. I would like to know how moms hold it all together. Day #3. Illness. . . and children–our role as a parent. Most people have just one of these challenges. They parent. Or they are ill. Or they were parents of young kids; now, with adult children, they deal with being ill. The adult children take care of them. Teach them how to use an iphone to keep their medical records. How to call in the pharmacy and order meds without talking to someone. But some of us are parents now, of younger ones. And we are ill. And we are tired. We are a sick mom. How do you find energy out of depletion? How do you find patience when you cannot tie a single knot to hold on any longer? How do you smile at your child, act like he hung the moon, when he is screaming, “You are the meanest mom in the world!”–because you reminded him to brush his teeth. How to you tie his shoes when your fingers barely bend but your child begs you to help him since he likes them so tight they cut off his circulation? How do you open the lids? Pick up the legos? Clean up the dog hair, and other . . . dog . . . stuff? How do you make 2 meals so everyone eats–and you don’t have to go back to the hospital for more food therapy? How do you deal with all the comments and advice and simple ideas when your child is different–and has his own issues–and no one knows how hard it really is? How do you . . . how do you. . .how do you . . . when you are a sick mom? I write. I pray. 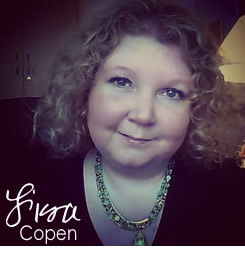 I blog. I talk. I try. I pray some more. I question. I call. I share. I pray some more. I hope. But I still feel like I don’t know what I am doing. Some days are miraculous. Some days are a messy disaster. Some days are easy. Most days are not. SOME DAY it will all be worthwhile–the discipline, the counseling, the conversations, the daily grind. But there are no guarantees. The world is so strong, the culture so overpowering, the emotions so fragile to the children in our life. Their spirit is so precious. I really–really–wish I didn’t have to be a sick mom. I wish I had more to give. To offer. But I trust God knows what He is doing. If you are a sick mom, I invite you to join me as I am working on a book for chronically ill moms that is faith-based. You can be a part of our encouragement, feedback team, and meet other moms at our Facebook page Moms with Illness. As I write this book, I learn. I try. I practice. I experiment. I pray my struggles will some day bless others. Because we all want the very best for our kids. We want to be the best. We just aren’t sure exactly where we run dry and God takes over. Filed Under: Articles, Founder's Blog, Parenting, This is Me, What's New? 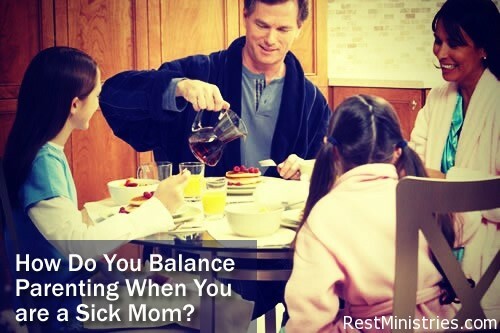 5 Responses to How Do You Balance Parenting When You are a Sick Mom? Although I am pleased to see a book and conversation on this topic I really would love to see something more tangible. I am one of those moms – a single mom – and I need tangible help. More than hope, etc. Not to minimize the faith-based side of this, but where does one go for real help? Petula – I had to find others around me that could tangibly help, and I live in a community where that was not simple. My family is in different states. Asking for help from local family always involved “payback.” Some of the suggestions, honestly, came from my health care team. Meetup.com had a moms group listed. I met some of the moms accidentally, and though I felt very nervous about it, I started initializing conversations. Some of them helped watch my son during appointments. Some of them made time just to spend with me. Another helped me figure out what my needs were, since I was too overwhelmed to really see the whole picture clearly. Everyone’s needs, just like our illnesses, are different. What I tangibly need is different from what you might need, and our communities are not the same. If there is an Employee Assistance Program available to you, it could be a good starting place. This is more than a blog conversation, though. Oh Lisa, this brings back sooo many reflections. .. My 8 year old pushing the vacuum with all her might with her little skirt swinging back and forth, etc. Kids with sick moms learn responsibility so much younger, and that’s really not such a bad thing either given our overly comfortable society these days. But my heart truly goes out to sick moms of little ones. My 3 children were ages 2-12 yrs when I became bedridden with CFS. They are now adults raising their own families and by God’s grace are doing a fine job of it. I remained very ill for nearly 10 yrs which were the most vital years of their growing up. I had to fight the temptation to feel sorry for myself. 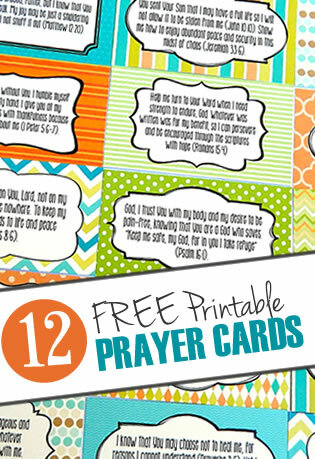 I don’t know how to answer all those specific questions but as an overarching approach I would advise to stay in the Scriptures and in prayer as much as possible. This is the only thing that will give us any true peace of mind and give us the means to use this as a positive teaching tool for our children. After my kids were grown one of them expressed how frightened she always was that I might die while she was at school. I think we need to watch out for that and use this as an opportunity to teach them compassion for those who suffer but also to not be afraid because God is in control of every day. We can use our illness to teach them that He is the one who gives us afflictions to make our faith stronger and He will give us the grace to handle it together as a family. Teach them to be open with their feelings about our illness and teach them to pray about these things. We can also use our own limitations to teach them that it’s really okay to say “NO” (since we have do it so much ourselves 🙂 – That can serve them well when they are older. When our son went off to Bible college he wrote an essay about my illness and dedicated it to me. He did his own research and it was a true reward from God to me for all of those years of suffering. This is a subject close to my heart and a great articles and great comments. I’m so blessed when my husband wanted a divorce after 10 yrs. of marriage, 2 kids and myself being diagnosed w/ MS and depression, that I already had a pretty good support system in place, although I had moved to the area only 9 yrs. before. I had no close family nearby (although a cousin of mine lived nearby), but I had good long-distance support from my parents and sisters and good old long-distance friends w/ whom I’m maintained close contact. I’ve always made friends easily, so I had a lot of work friends that were real friends–we did things together outside of work and really supported one another emotionally. I had a lot of church friends (true friends, not just acquaintences) and a few other close local friends. It really takes a village–I was struggling so much already to continue working, so finances plunged and it was not pretty, only worsening my depression, of course, and the stress was definitely hard on my MS. We’re responsible for putting our own support system in place if we don’t have one–sometimes we have to repair estranged relationships w/ family members when we really need help. We have to active seek what local help is available, but in the end we ourselves are responsible for taking care of the little lives w/ which we were blessed–and produced by our own actions and decisions. If we didn’t pick the best man w/ whom to have children, well, that’s on us, but if I could do things over, I’d still marry the same man, because otherwise I wouldn’t have the exact children that I do (also if I hadn’t gotten pregnant w/ that precise egg and sperm at that particular time.) Things are so much better now–raising them was hard, and my relationship w/ their father was very strained at times. They’re 19 and 23 now and fine young men. I’m also blessed that I’ve been able to have a cordial relationship w/ their father and his new wife, something that I wouldn’t have thought possible. I moved from OK to MI 2.5 yrs. ago because a few yrs. before he had married a woman from MI and later taken a professorship here. My boys could go to college here tuition-free at his school and about 200 others w/ reciprocity agreements. The older one had already started at the school where his dad teaches (now graduated) and my younger one wasn’t sure where he wanted to go, but knew it would be up this direction. I can no longer drive and my ex and his wife have both helped me w/ rides at times, a true blessing. When we lost power in an ice storm and my younger son and I had spent a pretty cool night w/o heat, my ex came and got us and took us to his house, which had power. He could have taken only my son and suggested I go to my other son’s house or his fiancee’s mom’s house. But he and his wife kindly took me in and were very hospitable. I slept on their couch one night and then a motel room opened up (a place that had power.) I only had to spend one night there and then my power was back, but support like this is crucial for many of us–single mom or not, ill or not. Maintaining good relationships, showing a thankful heart and doing for others what we can as a way to thank them and to help them can go a long way toward establishing and maintaining a support system. I’ve had MS for 20 yrs. and now also deal w/ fibromyalgia, osteoarthritis, psoriatic arthritis and was diagnosed w/ breast cancer in Jan. (now in remission after lumpectomy and radiation.) I have to accept help frequently from my sons, the older one’s fiancee’, her mom and occasionally my ex and his wife. It’s really hard to ask for help, esp. when you’re the one who used to be able to help others–I was an RN and also active in church ministries. Living w/ illness and in basic poverty (on disability) has taught me so many things and helped me grow as a person. I only hope that I did a good enough job w/ my boys (as did my ex and his wife) that they turn out as well as it appears they are going to. I pray for my boys every day and always have. They’re the most important thing I’ll ever do.